The group meets monthly and is for men who have you been affected by cancer, either as a patient or in support of someone else? Why not pop along to the meeting for a chat, or simply listen to the issues that affect men living with cancer. The purpose of the meetings is to learn from each other in order to improve our physical, emotional and/or financial well-being. We often have a good laugh and talk about many different things other than cancer. Tea, coffee and a friendly smile are always available. 18th April (question and answer session with a Macmillan nurse), 16 May (talk about the benefits of therapy) , 20th June, 18th July, 15th August, 19th September, 17th October, 21st November, 19th December. 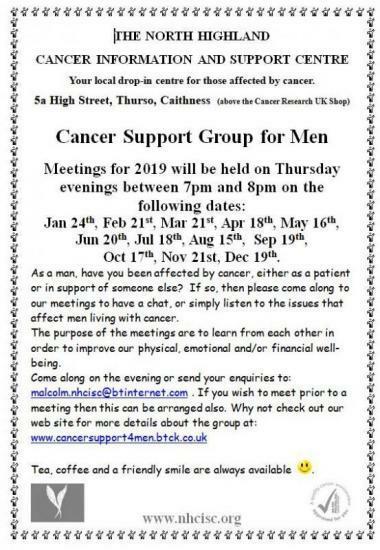 Meetings take place at The North Highland Cancer Information and Support Centre which is located at 5a High Street, Thurso and is above the Cancer Research UK Shop at 7p.m. If you require more information then please send an email to malcolm.nhcisc@btinternet.com or check out our web site at: www.cancersupport4men.btck.co.uk or phone Malcolm at 01847 851689.